E-mail me or call and tell me the name of the person you want to contact. For example, "my daughter Beth" This way we can both set the intention for Beth to come into the room at the appointed time. I can communicate with deceased loved ones or pets over the phone or in person. This isn't a requirement but if the session is by phone, e-mail or send a picture of the person or pet if it is convenient. The energy of the picture actually does slightly help. It isn't necessary but it does help. The reason it helps is because the deceased person isn't in a human body anymore and is a ball of light! (orb!) They will do their best to project an image of what they used to look like to me but it isn't always that simple. I feel and understand their personality much more than what they used to look like because of that. A picture validates for me the personality and feelings I feel when I speak with a deceased loved one and helps me match up with their energetic blue print. I am a very empathic medium. This means that when I open up my energy field to talk to a deceased person, I will feel their feelings inside of my body. I will immediately know how they are doing in the spirit realm. I will then convey to you their current emotional state, and how they are adjusting to the spirit realm, and WHERE they are in the spirit realm as well. (Every person goes to a difference part of the spirit realm depending on how they died.) I will also see or sense a person with other loved ones on the other side as well. I will hear messages from them in my mind, or they will give me images of their life or give me symbols to interpret that most often make sense to the client. It is important to not have any expectations about what will happen when you want to contact a deceased loved one. 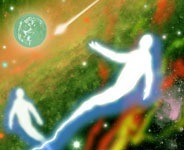 They are in a different realm and that realm operates differently from Earth. If you are someone who is skeptical, looking for proof that the spirit realm exists, or are more interested in the proof that I am speaking with your loved one instead of just letting the process flow, then I am not the medium for you. Letting the process flow means that the person I am talking to will give me plenty of information that will reveal their true personality and such naturally.They will do their best to show me all those things about how they feel about their crossing, their life, how they feel about you, and what they have been up to! So talking to a deceased person is not like talking to someone on the telephone. It is more like talking to someone on a cell phone with a bad signal! Deceased people have to get more creative with sending information by giving us signs, symbols, images etc. If they were shy on Earth, chances are they are shy in Heaven! They might have a challenging time conveying information to me at first. The loud boastful talkative guy will still be the same in Heaven as on Earth and he won't have trouble communicating with me, even with the dimensional hurdle! Those types of personalities come through loud and clear. Mediumship isn't just helpful for you, but also the person in question. "I have been talking to Eos over the years whenever I want to speak to my deceased family. Having them speak through her is fun and puts me at ease every time. I have seen two well known mediums before, but I like the way my family speaks to Eos the best because it is more personal which makes it feel more real and special to me. I end up hanging up the phone feeling like I really did just connect with my family!" Johnna Lyn B. Dallas, TX. I do love talking to people in the spirit realm and have done it since I was a child. Throughout my life I have dealt with unhappy ghosts along with women and children who need help going to the fun part of the spirit realm. I do enjoy being apart of this reunion with your loved one and enjoy conveying all the messages I hear. Its a very special experience.